Ryan Grant is someone who I met at the Import Summit last year and I’ve been following his work every since. He runs the popular site OnlineSellingExperiment.com where he talks about all of his adventures selling physical products online. Now if you recall way back in episode 17, I had Jessica Larrew on the podcast to talk about her Amazon retail arbitrage business. Well Ryan has taken that same model of retail and online arbitrage and scaled it to small company with employees. What is online and retail arbitrage? It’s the process of buying from retail stores and liquidation outlets and selling those products on Amazon. Anyway, last time we spoke, Ryan had a pretty nifty operation going on and I want to catch up with what he’s up to today. Enjoy the interview! How Ryan got into selling online. How he knows what goods are going to sell. Where he consistently finds goods to sell. How he deals with unsold inventory. Now before we begin, I also want to give a shout out to sitelock.com for being a sponsor of the show. SiteLock is the leader in website security, and protects over 8 million websites by monitoring them from malicious activities 24 hours a day, 7 days a week. So here is the thing, most online business owners never think about security until they get hacked. My online store got hacked long ago, and it was the most miserable experience ever. Steve: All right we’re good now, okay. Welcome to the My Wife Quit Her Job Podcast. Today I’m thrilled to have Ryan Grant on the podcast today. Ryan is somebody who I met at the Import Summit last year, and I’ve been following his work ever since. He runs the popular site onlinesellingexperiment.com, where he talks about all his adventures selling physical products online. If you recall way back in episode 17, I had this woman named Jessica Larrew on the podcast to talk about her Amazon retail arbitrage business. Well Ryan has taken a similar model of retail and online arbitrage, and he’s scaled it to a small company with employees and procedures. Now what is online and retail arbitrage? It’s the process of buying from retail stores and liquidation outlets, and selling those products on Amazon. Anyways last time we spoke Ryan had a pretty nifty operation going on, and I want to catch up with him and see what he’s up to today. With that welcome to the show Ryan, how are you doing today man? Ryan: Doing great Steve, thanks for having me. Steve: Yeah, give us the quick background story; tell us about your business, how you got started, and kind of what you sell, and how your operation is like today? Ryan: Sure, so I got started selling on Amazon back in 2008 when I was a freshman in college. I went to the college book store with the text books that I had paid quite a bit of money for, and saw what they were offering for those books, and was quite disappointed with the offer. So I began to explore other options for selling those books which ultimately led me to Amazon. Then throughout college I would sell my books, I would sell friend’s books, and eventually started buying books from essentially as many students as possible at the university I went in Minnesota. Then we gradually expanded to other campuses as well, primarily focused just on text books. Then I had that going from about 2008, and in 2013, that was about 2 years after I graduated was still doing the text book stuff. I had a job as an accountant, didn’t really like that, so I decided to see if I could pursue selling on Amazon as a full time income. On September 2013 is when I started my current operation, which is the primary income source for me now, and then that is selling arbitrage products like Steve mentioned in the introduction. So it’s everywhere from online stores, retail stores, we’ll buy liquidations and close out from companies that are looking to get rid of goods in bulk, and then we’ll buy direct from manufacturers of brands. We don’t try to label anything at the moment, but we’ll buy like tickets. That’s why a company like Mitel for example we don’t buy from them, but we buy direct from those. The operation currently, there is myself and then there is 7 other people, and they have a variety of roles to running the operations of the business, going out to these stores and some of our sources, and purchasing the goods. Then there is people that are processing the goods for Amazon at their warehouses as well removing price stickers, doing all the things that need to be done to meet Amazon’s requirements. It’s been a gradual process, but all about the past 3 and a half years, and working at the point where my time isn’t needed to run the business day to day. That goal was pretty much realized in January of this year, so for the past 5 or 6 months I’ve been able to pretty much have things continue to grow without a ton of my direct involvement. There still sometime that goes there, but it’s primarily focused exclusively on growth as opposed to just day to day operations. That’s a quick look at where things are at today. Ryan: The textbook operation is not currently going; it’s something I might revive now that we’ve got a bigger team in place. It’s something I see out of doing just because it’s fairly capital intensive and very seasonal. There is 2 main times a year to buy textbooks at the end of each semester. So I switched over to buying products that sell better year round, but now that the business is in a better financial position, and then there is more manpower as well, it’s something that I’m looking to put back into the fold in the near future, most likely in December of this year when the close of the next college semester comes. Steve: Interesting, I’ve been out of school for a long time, they still use paper text books? Ryan: They try to [inaudible 00:06:47] e-books. Honestly they end up being a lot more expensive for students, because they can’t resell them when they’re done with them. So even if you pay like 200 bucks for a book, and then at the end you can sell it for 120 bucks, you only loose 80 buck. So even if the e-book was 20% cheaper at the beginning, and you paid 160, you come out quite a bit better with the physical book. Steve: I see that makes sense. Did you ever work as an accountant? Ryan: I wasn’t going to stick it out. Steve: Were you doing your Amazon thing while you were working as an accountant? Ryan: I was doing it a little bit, so I knew I wanted to quit my job previous, well honestly within the first 6 months I had it. I kind of began planning my exit. One of the big reasons I didn’t quit right away is I just wanted to be in a good financial position to give myself as much run way to try out something new as possible. One of the things I wanted to do before I quit was to buy an owner occupied duplex which I was able to do, and then I got that in place, and then I started to spend more time on the Amazon business prior to quitting. So I would say like the past six months before I quit I was trying to spend five to ten hours a week at least on the Amazon business. It was still the point where I was making between $500 and $1000 dollars a month at the point when I quit. I felt that the time investment would scale up to a full time income if I was able to dedicate full time hours to the Amazon business, which ultimately played out pretty well. Steve: I was hoping you would be able to walk me through the arbitrage business, and how the business works exactly. Back when you didn’t have a full team, can you talk about where you got the products and what the procedure was like, and how you priced everything, that sort of thing? Ryan: Yeah, we can well do that. Back when it was just me, my main sources initially were just retail source, Wal-Marts, Targets, Toys R Us, things like that, that were available nationwide. Then some of the better sources were some of the Mom and Pop discount type source that were only available in my area just due to people not being able to get their hands on the same products nationwide, it helps to maintain prices online. The general concept though is you go into these stores, you look for items that are sold at a discount, or might only be available in your region, and you’re looking for items that will be selling for more on Amazon than they are in the stores, or in the store that you’re sourcing in or you’re buying in. Sourcing is the term that’s generally used in the arbitrage world for going and finding products. You have an app on your phone, now there is one called the Amazon seller app, it’s completely free, and it does pretty much everything you need. You use the camera on the phone to scan the barcode on the products, and it’s going to display all the details on that product. You will be able to see the price it’s selling for on Amazon. You’ll also be able to see the fees that will come out if you sell it via the fulfillment by Amazon program, so you can see exactly how that compares with the prices at that store. Then you can also see the reviews of the product, and the sales record of the product. The sales record of the products is something specific to Amazon, and it gives you an idea of how well that product sells. The law of the sales right number, the better the product sells as a general rule, and that number is going to fluctuate over time. Basically you’re looking for products that return the minimum return on investment that you’re looking for. I normally recommend starting out somewhere between 50 and 100% depending on your risk tolerance straight away. Steve: This is after fees, Right? Ryan: Exactly, after fees as that gives you some margin for error if prices go down, if the item [inaudible 00:11:16] and things like that. The higher you can stretch what you set right away, the higher the probability of success, and the more things can go wrong, you still come out okay. The primary things on the app like right away I’m looking at, the number one thing is the net pay out or the net amount that I will get after fees. Then you calculate your ROI percentage based on that, and then I want a sales rank. Generally speaking there is many caveats to this, but generally speaking less than 10,000 is an item that is going to sell relatively quickly in most categories. One of the things about sales rank is that every category on Amazon has a different sales rank, so textbooks or books is an entire category, and it’s entirely separate from say the health and beauty category in a sales rank of say 50, 000 in both categories is going to sell through in at a vastly different rates. So those are cut signs are some of the things you pick out right away. Starting with looking for items right under 100,000 is a decent way to start, and then as you get sales, you can iterate on that and find out what’s working, and expand those rankings to what works best for you. Steve: In terms of just a product, like I wouldn’t just walk in to like a Wal-Mart and just start randomly scanning stuff, right? Do you have any criteria, or where you like to go typically? Ryan: Yeah, typically I like to start with like the clearance sections of the store, and then that works better like local discount stores and Wal-Marts, places that don’t have nationwide clearance. Target for example they typically, if an item is on clearance at one Target, it’s typically on clearance at thousands of other Targets throughout the country, and there is many people who do this. Steve: Give me an example of that. Ryan: In Minnesota there is a leap year soft drink, it’s called Dad’s [inaudible 00:13:32] and it’s only available in certain areas. It’s available for example at [inaudible 00:13:38] usually. You can get a liter bottle for about a dollar. For quite a while you could sell a three pack of them for about $25. Ryan: Yeah, and these even you didn’t have to ship merchant fulfilled, so that’s not using Amazon’s FBA program just because it’s an item that can explode, because of– like that item is only available in Minnesota for example. If people move to another state, and they really loved that product, they’re often willing to pay a very huge premium for it online. That’s the logic for the regional product, and it’s just a little bit more exclusive, and they are let’s say a copy of the board game monopoly, or something that’s going to be available in every store. Ryan: Yeah, it depends on what is available in each store. Basically with this model you’ll sell just about anything. It doesn’t really matter if it’s a toy or if it’s a [inaudible 00:14:56] item for example, or if it’s toothpaste. All that really matters is what it’s going for online versus what you can buy it for, and the sales process. Really it’s not that focused when you’re doing the retail arbitrage. You evaluate the opportunities that exist in whatever store that you are in regardless of the category. Steve: Amazon has gotten a little more strict about on gating for categories, right? Do you have any comments on that, like food and beverage for example you have to get on gated for that? Ryan: Yes they are, so if you’re brand new to the count you won’t be able to sell grocery, health, and beauty. You won’t be able to sell like clothes, shoes, luggage, high end handbags, sunglasses, things like that. Mainly consumables and high end products or things that are easily counterfeited are the main products that you can’t sell right out of the gate. There is an approval process for all of them. It generally involves buying direct from wholesalers or distributors, so those will be buying more high up the supply chain, more direct from the brand or from a distributor of those brands, and then you submit those invoices to Amazon, and then you’ll be allowed to sell pretty much any product in those categories. If you get the approval once, you’ll get to go to sell all the products in that category. It’s not generally something I would recommend just right out of the gate. There’s tons of categories that are available to sell in upon. But if you give it a go and you have some real success, and you’re looking to expand, then I definitely recommend looking into getting that approvals and spending the time to get that approval, because there is less competition in those products and categories just due to not all new sellers being able to sell them, so it’s a little bit more exclusive. Steve: Okay, so once you do find a product, and presumably you’re listing it on top of another process listing, right? Another listing on Amazon? Steve: It’s right, okay. So does that mean that you have to constantly monitor your listing to make sure you have the buy box? Ryan: Yes, so you’re always looking to have the buy box, and then that’s a pretty big topic in and of itself, because there is many components that go in to winning the buy box. The ones that you can easily control are your feedback percentage, your fulfillment method, and what your price is. Feedback is, you can use tools to make sure that you’re maximizing your feedback and sending follow up sequences to buyers to maximize that percentage. Fulfillment method if you get a bomb going for the buy box when you use fulfillment by Amazon program versus shipping the item yourself. The closer you are to the lowest price generally speaking, the higher the chance you’ll have the buy box. Steve: When you’re talking about feedback in the world of retail arbitrage, is that seller feedback, or is that product feedback that you’re more concerned about? Ryan: That would be seller feedback. Steve: Okay, got it. So does that imply then that your sequences are more focused on getting the person to leave you seller feedback, like the product feedback doesn’t matter at all at that point, right? Ryan: Exactly, yeah it’s purely to get a feedback for the individual seller. Steve: Okay, and then are you doing all of your stuff FBA when you can? Steve: Okay and I’m just curious how many skews do you have outstanding today across all your employees and everything? Ryan: That’s a good question. Steve: It doesn’t have to be exact; I’m just trying to get an idea of what ball park it is. Ryan: Between three and 5,000 I would say. Steve: Three and 5,000 skews, okay. So for all those skews you have to monitor whether you have the buy box on a day to day basis, right? Ryan: Yep, and there is software that we use to do that. It’s called the repricer, and you set up rules to have– basically have them change your price depending on what is going on with these individual listings so that you don’t have to monitor each one individually. Steve: One thing I’ve always been curious about is if everyone is using this repricing software, doesn’t the price just continue sinking lower and lower? Ryan: It can, it depends on which rules you use for the repricer. So my recommendation to people and what I do personally is I don’t want you participating in the item continuing to drop in price. So what I want my profiles to do is to maximize my sales value, so generally what I’ll do is I’ll price lately between one cent above the lowest price, and about one a half percent above the lowest price depending on the individual products, and depending on the category. Rarely am I going to contribute pushing the price down, because I want my price a little bit above, and you’re still able to take the buy box even at a higher price than the other buy boxes. There is many factors that go into it such as the location of the item relative to where the customer is and things like that. Then the most aggressive profile that I usually do is matching the buy box, or matching the FBA price. So if another seller has it set to consistently beat whoever lowest price is, or they always want to be say a cent below the lowest offer available, then I will sort of contribute to that. Another important piece with the repricer is you set up a minimum price or a floor price that repricer won’t go below regardless of what the market is doing, but then you have to take action on the listing if you wanted to drop the price further. So there’s quite a few precautions. But yeah if people don’t know what they’re doing with repricer, it can get ugly and in reality that can create some buying opportunities too, because if two people are every 15 minutes, they are lowering their price by a penny or by 10 cents, that reduces prices very quickly, but then that creates an arbitrage opportunity to ultimately buy the item from those sellers, and sell back at the same listing. So if you do some tricks to take advantage of those situations for profit still, but to the overall market place when the repricer gets in to the hands of someone who doesn’t know how to use it, it’s a little bit dangerous. Steve: So you obviously need the buy box to make sales, but from what it sounds like you’re saying is that the buy box can shift multiple times during the day? Ryan: Absolutely, different people, say someone on the East Coast and someone on the West Coast could be looking at an identical products, and see a different story on the buy box at the same exact time. So yeah the buy box is constantly rotating, and there is reports that you can run in Amazon on kind of individual item basis to see what percentage of the time you are in the buy box, and then that can help you tweak your repricing, and also create a pricing strategies at the minimum. Steve: So what do you like to see this percentage at, because presumably all your items have other people selling on it, right? Steve: Like a chiboka mask for example. Ryan: Like a chiboka mask, exactly. If you’re selling one of those, it might not matter if you only have the buy box one percent of the time if you have say 10 units or less. Then say it’s a book or a home improvement item that doesn’t sell very often, you might want the buy box more like 50% of the time if you can have that. So I don’t know, it really depends on a per item basis, but at the minimum I usually like double digit percentages on most listings unless– so 10% or more unless it’s something that’s really flying off the shelves. Steve: Interesting, do you do any bundling? Ryan: I don’t do very much bundling; it’s mainly selling on existing listings for now. Steve: Okay, I was going to ask for your opinion on how like Amazon’s cracking down on the bar codes right now, especially for bundling of bigger brands, but it doesn’t sound like you encounter that at all. Ryan: Yeah, I haven’t had to deal with that juice yet, it sounds like– I mean if people want to be 100% safe, it sounds like you want a GS1 which is the official place, that’s the safest route to go. It’s more expensive, but it ensures your bases are covered. Steve: Okay and so one question I’ve always wondered about just the whole retail and online arbitrage space is how do you consistently get goods to sell on a consistent basis? Ryan: With this type of business, it really is all a function of spending. It’s all based on the products you’re buying and buying correctly. Over the past three years we’ve created with my business pretty specific buying guidelines that we’re looking for, and criteria that we’re looking for in products. So we’re looking for a certain return on investment, we’re looking for a certain sales rank, certain reviews, there is some other things we factor in as well. But when we buy products that fit those criteria, and then when it’s spread out over enough skews, it has a way of being consistent over time. I don’t know, it’s kind of like the more or less divine guidelines or the formula, if you put the right inputs into the formula, you get the right output. It’s only sure on top of if you buy right, and then if you’re on top of every pricing and making sure that you’re controlling your inventory levels on each individual item, you tend to get pretty usable results. Steve: I just want to take a moment to thank Bench Accounting for being a sponsor of the show. Now I love running my ecommerce store, but you know what I hate doing the most? Book keeping, seriously keeping track of receipts, expenses, and especially inventory costs are easily the worse aspects of entrepreneurship hands down. No more data entry, no more data crunching, no more headaches, plus it’s reasonably priced. 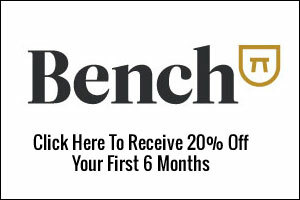 The best part is you can get 20% off your first 6 months if you go to bench.co/mywifequitherjob. Once again that’s bench.co/mywifequitherjob to get 20% off you first 6 months, now back to the show. The people who are doing the buying right now for you, are they literally still walking into Wal-Marts, or do you have like a more consistent source of goods now. Ryan: The Wal-Mart piece, some are literary still walking into Wal-Marts, but we also have– like some of our online sources are more sustainable, and then some of our wholesalers are wholesale sources where we buy direct from either the distributor, or direct from the company. Those are products we also consistently buy again and again. Steve: How does that work actually, so are you kind of acting like a marshals in a way? Ryan: In the sense of like buying from a distributor? Ryan: Sure, in a sense it’s more or less like let’s just say I like using with the game monopoly for examples, so if you can buy that direct from Hasbro I believe they’re– it’s Hasbro or Parker Brothers, whoever makes it. You can buy that say direct from them for 6 bucks a unit, and then you can sell it Amazon for 15, and make I don’t know 3 or 4 bucks. The way that works is essentially you buy 100 to start, then once you get down to say 25 units, you just call them up and say, “Hey I want another 100 units of this,” then you can keep selling that. So we just do that with various products on Amazon. Steve: But someone like Hasbro is not going to want to sell to someone who just sells on Amazon, right? Ryan: Generally speaking no. They would be able to handle that on their own, and Hasbro for example, they probably aren’t going to give someone like me the discounts that I would need to even make a profit. Yeah, this tends to work better with much smaller companies who are looking for more a soldier for their products. Steve: Can you give me an example so like a much smaller like no name brand or? Ryan: Yeah like a no name brands let’s say generally yeah– let’s see. Steve: You don’t want to give away that. 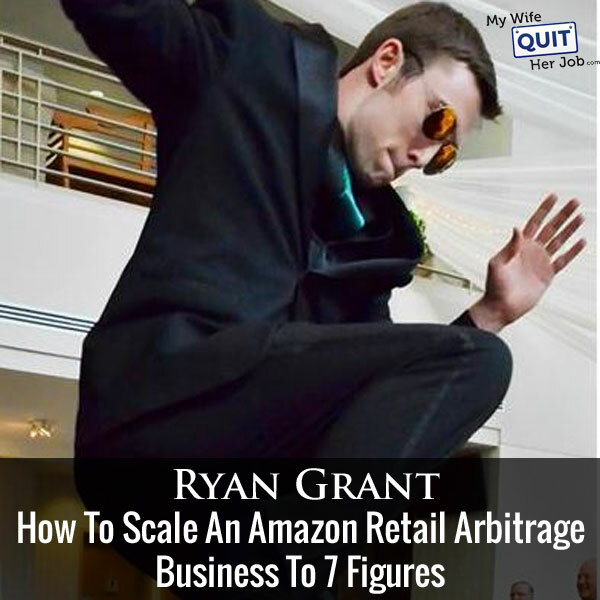 Ryan: I don’t want to give away specific products, that’s kind of one of the unfortunate things about an Amazon arbitrage business is that you can’t directly promote yourself to everyone out there, or it kind of creates problems. Steve: Well, so it’s not important what the exact company is, but why doesn’t that company just list its own stuff on Amazon? Ryan: That’s a good question. They might not have the expertise, they might not have all the– the short answer is they should, but they might not for a variety of reasons. Like a lot of companies for example they sell products, they just might sell from a reseller presence for like physical transactions, they don’t do much in the role of e-commerce at all. There is lots of people that really don’t even know that it’s an option. Steve: For these guys then, are you creating a new listing, or do they already have a listing existing at Amazon? Ryan: We went only targeting ones that have an existing listing, and it will help them to improve the listing, because we just like to see some sense of demand for the products which is hard to do before it’s on Amazon, and then we’ll have to improve it if needed. Steve: Wait okay, so they are already selling on Amazon then or? Ryan: Well someone has sold their product on Amazon previously. Ryan: Pretty much anybody could create a listing for any product they want regardless of if they are the actual brand or not, and then all people going forward will use that listing to sell for that unique UBC. Steve: Okay, and so you’re helping the brand with their listing? Steve: I’m just curious like I’m that company, you’re helping me do this, after a while I’m just going to be like wow thanks, I’m going to just start shipping my own stuff there. So I’m just curious, like what the turnover is like between the vendors that you use? Ryan: Most of the ones that we’re targeting, they’re looking to sell wholesale, like they don’t want to go direct to the consumer, they want to sell 100 units at a time, make their hit to the margin, and then they’re happy with that. I mean we don’t see a ton of turnover due to them moving on and wanting to sell the products on their own. A more likely scenario that happens is too many sellers come in that are willing to sell at a lower margin, or Amazon themselves comes in and sells that same products. Those are the bigger things that we run into. Steve: Then there are guys who are selling you the wholesale stuff; do they have relationships directly with the brands? Ryan: Yes, they work in direct with the brands, sometimes they represent many, sometimes they represent just one. It ultimately depends on the business and the individual. Steve: And then do those guys have retail shops as well, or are they purely like a middle man? Ryan: Most of them are purely a middle man. Steve: Interesting, okay. I’m just wondering what the incentive for brands to work with these guys are? I guess there is liquidation outlets? Ryan: Some are liquidation, like liquidation has gone to a whole another ball game. I guess the reason brands in my opinion do it is because they are good at making the products, there’s kind of like a private label or importing any product. They are just the first line of the food chain, like they get all the value with the IP that their brand has, like the components of like a game of monopoly for example costs nothing to make. If they can sell it in bulk for six or seven bucks to one level, and then they turn around and sell it for 10, and the retailer sells it at 15, everybody gets some piece of the pie, but some of these big companies just don’t want to go through– they got the manufacturer piece, but they don’t want to get involved with the sales. I agree with you they could cut out all these levels and create a lot of margin for themselves. I don’t think they see it as their core businesses. That’s similar to like where stores like Target and Wal-Mart, they’ll move items on clearance to clear shelf space if they don’t sell on there, so ultimately ship them as liquidators, because they know that that shelf space to them is more valuable than really recouping any value for a small percentage of the products. It’s ultimately that each process in my opinion is just focusing on their core business and not ruining what they’re good at, at the expense of opportunities that appear to be shining objects. Steve: Would you say that in the arbitrage game like the Holy Grail is to find these wholesale outlets as opposed walking through like a Wal-Mart or Target? Steve: Where do you find these wholesale outlets, like do you just go on the internet, or is there a procedure for finding them? Ryan: Pretty much we’ll go to like tradeshow websites, and see if we can find people that are looking to sell their products. Then reach out to them if their product is already on Amazon, and see if we can represent them there, or if they’re willing to sell to us, or we’ll sell it on Amazon, but then go to Google and see if we can find a distributor with the arbitrage on to you. You’re selling a ton of different products, so you know what sells well in some cases, and you might not be able to get it in retail stores any more. You could go and look at the packaging and then go direct to the source, and see if you can find it that way. So there is quite a few different options for finding them. Ryan: That’s the route my business has taken. We’ve been doing that for a long time, we’ve got good systems in place, so there is no point of really slowing down, but with the excess cash flow, that’s starting to build up a wholesale business and things that are more sustainable than just constantly going into the retail stores. Steve: So are you doing wholesaling now then, and private labeling? Steve: Yeah they are a really fussy yeah. Ryan: Yeah, so wholesale what I talk about there is purchasing direct from a distributor or manufacturer, or a brand. That we’re doing, but we’re not like wholesaling products out to someone else. Ryan: So my college is there. Steve: For your staff, I’m just curious like how do you assign them to source, like you got seven guys, right? Ryan: Yup, and three of them source pretty much all the time, and then one sources some of the time, then the other three are in the warehouse working at wholesale, or working on shipping products out the door. Steve: Okay, and then in terms of your assignment, so you mentioned you do a little bit of everything, right? So how do you decide like how do you distribute resources whether you want them to go to retail stores versus reaching out to wholesalers, and that sort of thing? Ryan: Yeah so the retail stores we’ve got schedules for each person, and there are certain stores that we know that we can just historically we’ve done well on. We want to make sure we hit those stores every couple of weeks, so that we’re constantly getting those spaces covered. Then one of the guy’s primary focus is wholesale, because that’s a priority. Steve: But you have to put down more money upfront though for those, don’t you? Ryan: You do, but normally we’re starting with the task order that’s less than $1000. Steve: So do your workers pull up to like Wal-Mart in like 18 wheeler? Steve: Oh really, okay so we’re talking still pretty small quantities right? Whatever can fit, it’s a done. Ryan: Yeah, it only calls for services needed, it’s up to them. I have a truck with a topper and stuff, so you can really load up if needed, but most of the [inaudible 00:38:05] there are coming from the source, so you’ll just have regular cars. Steve: This issue of trust like what’s stopping them from just buying the stuff themselves and doing the same thing on the side? Ryan: Sure, well we try to build that trust with each one of the guys before turning them over to be able to source. Then we also have like a basic non-compete agreement that says you’re not going to use this strategy for yourself while you’re doing it for me. They are compensated based on how much they buy too, and they only know one piece of the puzzle. We centralize them based on the amount that they purchase, and then they still only know one piece of the puzzle, like they might see that the items sells for this, but then they’re dropping it off at our warehouse, and the rest of the process is handled for them. Even though they know quite a bit, but they don’t necessarily know everything it takes to actually make the money. Steve: So the buyers do the buying, and then do you take care of the listing part then, is that like your secret source? Ryan: No, listing was outsourced now too beginning in January. That’s taken care of too, but each person is fairly segmented, like a sourcer to source, the lister lists and ships, and then the shippers pretty much just process items. So try to make sure that each person right away only knows exactly what they need to, but then as they show interest and aptitude to do more, then we’ll look into moving them into other roles and get them further into the business as it makes sense. Steve: Okay, and then so do you have like a big warehouse to run this operation then? Steve: Okay so it’s tiny. Ryan: Yeah, it’s pretty much just used as a processing space. We bring the products in and then one of the benefits of having a smaller space is it forces you to get products back out the door quickly, because we’re ultimately shipping them all to Amazon’s warehouse, and then they handle the rest. Steve: So is your turnaround like a day then? Ryan: Most of the time that will be our average. Steve: Okay, so I know for a fact that Amazon is making it much harder for people to arbitrage these days. Can you just comment on some of the recent Amazon changes, and how that’s affected you at all if it has affected you at all? Steve: I don’t know, I’m asking that question to you in general yeah. Ryan: Okay, things that make it harder, there are certain brands or certain product lines that they are becoming stingy on I would say. For example there was a game that was selling extremely well, it was called Pie Face in December, and then Amazon– right away anybody could sell it, you could list it, but then half way through they issued restrictions, so that not everyone could sell it unless you submitted invoices. The reason they did that was because there were counterfeit sellers mainly from overseas, but some from US as well who were selling on these listings and taking advantage of the demand. So that types of issues happening more and more. With that Amazon is doing what they can, and they are putting restrictions in place. Sometimes these restrictions come into place after you already have the items at Amazon’s warehouses, and then you’re kind of stuck with the inventory, or you have to sell via another route. Steve: What’s your other route, just curious? Ryan: Next option for us is usually eBay, and then after that we’re going to look to basically liquidate it. I’ve used liquidation.com before, and then there are some companies locally that will pay you effectively pennies on the dollar for items you can’t sell. So that’s our last stop, but we’re usually able to get rid of most of what doesn’t sell on Amazon on eBay. Steve: Can you comment a little bit about just arbitrage, the landscape in general, because I know a lot of people are starting to go into it. As a result of that there is more and more people hopping on these listings, so what is your secret sauce so to speak on how to stay above like all the other people who are entering the space? Ryan: That’s one of the things about an arbitrage opportunity is eventually people come in and try to close– not try but over time they get close. Some of the things that we do, we’re very diligent on our margins, we have very specific buying guidelines, so we can weather the storm if we need to, if the price on an item starts to increase, we’re pretty specific about where we purchase from. With three years of experience of doing this with many people involved, we know which places are good, which places we can get better than average deals, like in some places we’re getting better deals than are available to the general public. In some cases it is as much as 50% off what the stores generally sells it for. Since we’re buying in such large quantities, we get volume discounts. Building relationships with the right people in the stores goes a long way, and then just– I mean to the point the business is now at the point too where there is quite a bit of capital available, so we are not forced to sell products at a loss if we don’t want to. There is definitely times where we take losses, but if say we have a lot of stock in, and then because there is like a clearance at Target, it might be 3 to 6 months before that item re-bounce. Initially when all those sellers come in, the price will go down, but if you look at prices reach outs, and there are a few sites out there that will show you these, eventually items recover. Very few the price deteriorates, and then consistently stays down. So if you are able to weather that storm and hold on until a better opportunity to sell, that creates a lot of opportunities as well, because a lot of people are looking to sell the items within say 30 or 60 days, and then they’ll sell it no matter what the prices after that timeframe. Generally we’re looking to sell the items quickly too, but we’re not forced to just based on having more capital. Steve: What’s your goal on moving a particular buy, within 30 days or? Ryan: Our typical goal is within 90 days, we want to be sold out, and then that’s on some of our like higher quantity, I mean that’s the full quantity we’re buying on like a retail arbitrage buyer. Then we will adjust that too based on what the ROI percentage is. If it’s a lower ROI percentage we’re wanting it to move quicker, but if it’s say a 200% ROI we might be okay holding it for 5 to 6 months. Steve: When you say low, low is like 50%? Ryan: Low would be like 25%. Steve: 25%, okay and normal is 100% for you would you say? Steve: Okay, but those are easier to manage, right? Ryan: Oh yeah, you’re getting started at once, and then until you can keep some of the products as long as you want. Steve: Okay, so let me ask you this, like how much longer do you think that this whole getting into retail arbitrage and online arbitrage is going to last? Ryan: I think it’s going to last quite some time, so it’s hard to put an exact time line on it. Just based on what I see from myself and then all the people I know selling on Amazon, I know a lot of people that are doing quite well at it to the point where I’m confident if you know what you’re doing you can do really well. At the same time I do see lots of people coming in, so I think eventually the gaps are going to close or start compressing. But with enough money or with enough inputs I think there is still going to be a lot of opportunity either way. I mean in reality the fact that you can go in a Wal-Mart and buy something and make 75% return on your investment in a month on products that are generally available on the shelf is ridiculous. Steve: Yeah, it’s pretty crazy. Ryan: Yeah, I think it’s got a long way to go. Online arbitrage, there’s tons of tools and services coming out lately that are making it more accessible to get the information you need to make purchases, but if you’re disciplined in your buys, and you really put in the time to get the right items to your research, I think there is a lot of runway for both retail and online arbitrage. I think it’s a great way to create cash, but then at the same stroke and I think it’s wise to diversify and to wholesale or private label, or another sourcing method that’s going to be more sustainable for the long run. Steve: So just curious you mentioned that you have really good cash flow from this, how are you expanding going forward? Ryan: Right now we’re looking, like the primary amount of the new cash will be going to wholesale, so buying direct from the manufacturers and distributors. We will be looking to potentially add either people locally or potentially virtual assistants to help us with a lot of that research, and we’ll do the actual outreach. That’s the primary focus for the near term is to get as much money in the wholesale type accounts as possible. In terms of financing that, it will just be through the business, like through– because at the beginning is very much to spend [inaudible 00:48:50] pretty much since the beginning I didn’t start. I started with I don’t know three to $5,000, I don’t know the exact number any more, and then use credit cards strategically, never get any interest, and then I’ve just used cash the whole way, and now we’ll do multiple millions in sales this year. Steve: Do you guys take out loans, or is this just money within the business that you reinvest? Ryan: I have access to a lot of credit, but I haven’t used it yet, so everything so far has just been finance with cash in the business. Steve: Okay, that’s cool man, awesome. Ryan: Yeah, it’s been good. Steve: Well, hey Ryan I want to be respectful of your time, we’ve been chatting for quite a while. Where can people check out your work, I know you have a blog at Online Selling Experiment, but if anyone has any questions for you, where can they find you? Ryan: Yeah, the best place is probably the website as you mentioned onlinesellingexperiment.com. You can email me if you want, my email is Ryan@onlinesellingexperiment.com. Twitter is @walkaway50K, and that is on the first blog post on my blog which is titled walking away from 50k, which I did after I left my job. Steve: This is your accounting position? Ryan: So that became the Twitter handle, so any of those places are best, but yeah reach out if you have questions. Hope you enjoyed that episode. I find it amazing how Ryan has managed to scale a business model that is inherently not easily scalable, and with all the latest Amazon announcements about brand gating, I’m going to have to follow up with Ryan to see how this has affected his business. For more information about this episode, go to mywifequitherjob.com/episode132. I want to thank sitelock.com once again for sponsoring this episode. If you run your own hosted online store or any website for that matter that handles monetary transactions, you should give SiteLock a look. They can also help you with your site speed issues as well, and did you know that ecommerce sites that take longer than 5 seconds to load often shed customers. Now SiteLock offers a service called TrueSpeed that can increase download speeds by up to 50%. Go check out SiteLock today at sitelock.com/mywifequitherjob. If you go to that link you will get three months free. Once again that’s sitelock.com/mywifequitherjob. Once again if you are interested in starting your own online business, head on over to mywifequitherjob.com, and sign up for my free 6 day mini course, where I show you how to start a profitable online store. Sign up right there on the front page, and I will send you the course via email immediately. Thanks for listening.